Neutral doesn't have to be boring! With this set of three black-painted earrings, you can spice up your style quickly and easily. The top pair is a 1/4" wood button, dipped in black paint. 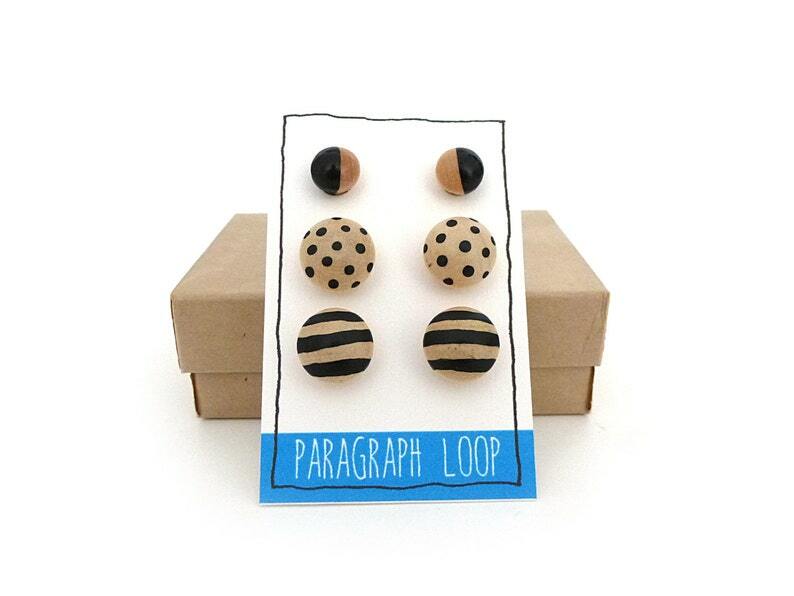 The polka dot and striped pairs are 1/2" wood buttons, uniquely hand-painted for an original look. All three earrings have surgical stainless steel posts, great for sensitive ears! Earrings come in a natural kraft jewelry box, perfect for gift giving and receiving. Like what you see but want something different? No problem - just request a custom order! I love working with my customers to create special jewelry. I love my earrings! They were shipped promptly, attractively packaged, and are really, really cute! I've worn a different pair each day since I received them. They are simple. but fun and funky. So pleased that I just ordered a necklace to go with them! I love my new earrings so much! Beautiful and simple. Thank you!